Istanbul (Turkey), Friday 13 September 2013 – The first-ever qualifying session for the Eni FIM Superbike World Championship at the Intercity Istanbul Park took place this afternoon, under sunny skies and warm temperatures. Sylvain Guintoli (Aprilia Racing Team), still second in the standings with a one-point gap from leader Tom Sykes (Kawasaki Racing Team) – after the CDI decision on the appeal lodged by Aprilia following Race 2 at Monza (May 12th) – set the fastest time in 1’56.190 seconds. The Frenchman led a pack of four riders still in contention for the title, as Marco Melandri (BMW Motorrad GoldBet), who was also second in first free practice behind Guintoli, got the better of third place Eugene Laverty (Aprilia Racing Team) and Tom Sykes. WSBK debutant Toni Elias (Red Devils Roma Aprilia) proved to be already on a good pace by ending up fifth, with a second gap from the lead, at his second outing onboard the RSV4, despite a technical problem. Jules Cluzel (FIXI Crescent Suzuki) managed to secure the sixth spot, followed by Chaz Davies (BMW Motorrad GoldBet), Davide Giugliano (Althea Racing Aprilia) and Leon Haslam (Pata Honda World Superbike). Haslam’s new team mate Michel Fabrizio was tenth, as the Italian is still getting to grips with the CBR1000RR. Leon Camier will sit out the rest of the weekend, due to the consequences of the heavy crash he had in the first free practice. The FIXI Crescent Suzuki rider suffered seven bones fractured in his right foot, and he’s currently undergoing surgery at the local hospital. Team Ducati Alstare duo of Carlos Checa and Ayrton Badovini did not get on track either, as they both crashed in the morning’s session. The Spaniard has been declared unfit to race (left scaphoid fracture), while the Italian rider’s conditions are still to be reviewed (left ankle bone contusion). Max Neukirchner (MR-Racing Ducati) injured his right hand (4th and 5th metarcarpal base fracture): the German rider is unfit to race, too. Moreover, Loris Baz (Kawasaki Racing Team) was not medically cleared by doctors, after the back injury suffered at Nurburgring, meaning he had to withdraw from the round. Times: 1. Guintoli (Aprilia) 1’56.190 average 165.453 kph; 2. Melandri (BMW) 1’56.749; 3. Laverty (Aprilia) 1’56.949; 4. Sykes (Kawasaki) 1’57.170; 5. Elias (Aprilia) 1’57.206; 6. Cluzel (Suzuki) 1’57.222; 7. Davies (BMW) 1’57.391; 8. 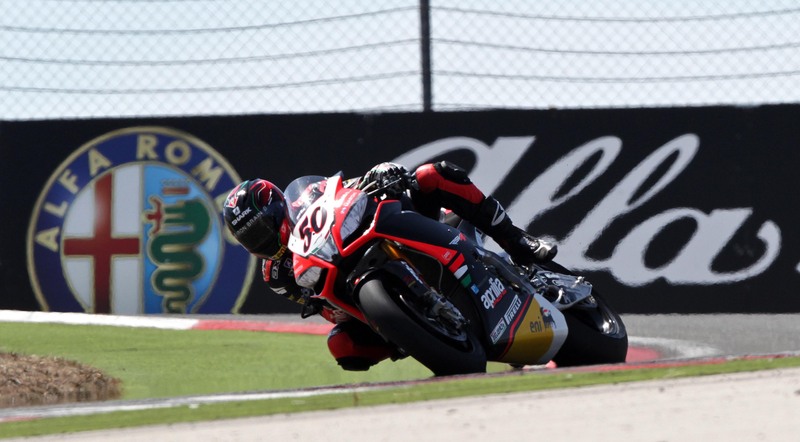 Giugliano (Aprilia) 1’57.649; 9. Haslam (Honda) 1’57.699; 10. Fabrizio (Honda) 1’58.340; 11. Aitchison (Kawasaki) 1’58.588; 12. Sandi (Kawasaki) 1’58.817; 13. Iannuzzo (BMW) 2’00.944; 14. Uprak (Kawasaki) 2’03.008; 15. Ercelik (BMW) 2’04.231. Times: 1. Lowes (Yamaha) 2’00.000 average 160.200 kph; 2. Sofuoglu (Kawasaki) 2’00.678; 3. Marino (Kawasaki) 2’00.798; 4. Tamburini (Honda) 2’00.802; 5. Salom (Kawasaki) 2’00.834; 6. Zanetti (Honda) 2’00.872; 7. De Rosa (Honda) 2’00.982; 8. Vd Mark (Honda) 2’01.147; 9. Coghlan (Kawasaki) 2’01.156; 10. Scassa (Kawasaki) 2’01.165; 11. Rolfo (MV Agusta) 2’01.258; 12. Menghi (Yamaha) 2’01.273; 13. Quarmby (Honda) 2’01.376; 14. Baldolini (Suzuki) 2’01.454; 15. Foret (Kawasaki) 2’01.491; etc. btw, race alert…!!! this is a rare triple header weekend. motogp’s in Italy, wsbk’s back (for the very first time) in Turkey, and AMA’s in “Joisey”…!! !